Silly scenes abound in Prometheus, but what lost me was our crack team of scientists removing their spacesuit helmets upon discovering a breathable atmosphere… in spite of whatever else might be lurking in the atmosphere to attack their immune systems. An undoubtedly daft moment that raised a laugh, even more so for Metroid fans. As bounty hunter Samus Aran, your Power Suit becomes an extension of you. Every component of the heads-up display informs your thinking. Energy levels, motion sensor, radiation and hazardous environment warnings, along with arm cannon settings, missiles, and a grapple beam – all available at the press of a button. Samus Aran’s scan visor analyses your surroundings and identifies environmental hazards. If only the crew of the Prometheus had used their HUDs! With all this equipment at your disposal, why would you want to remove your gear? Prometheus crew take note! Prometheus – in spite of global positioning systems and automated mapping devices, top-notch scientific minds contrive to get lost in a doughnut-shaped structure. 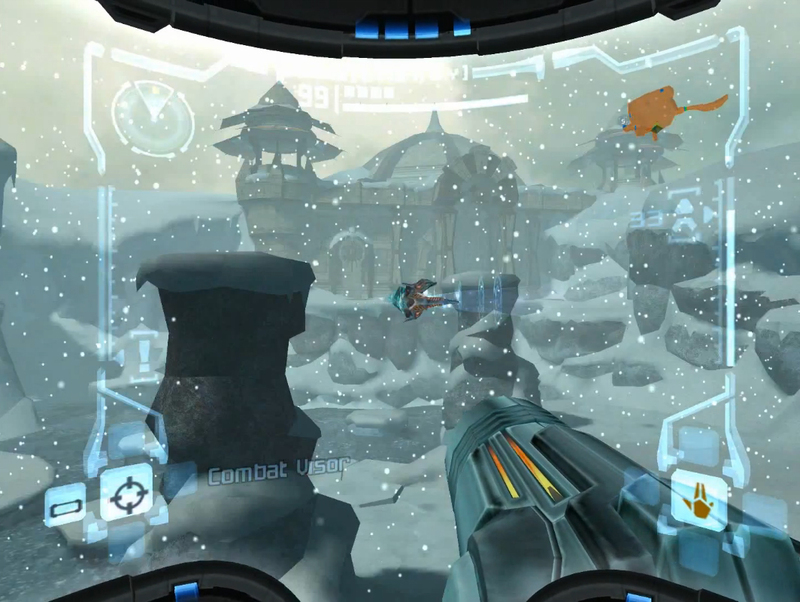 Metroid Prime – navigation made easy with a dynamic 3D map built into your HUD. Results – Samus Aran never gets lost. Ugly death awaits Prometheus crew. Where all these things came from is left a mystery, and feeds into outright horror as the xenomorph stalks the Nostromo crew. 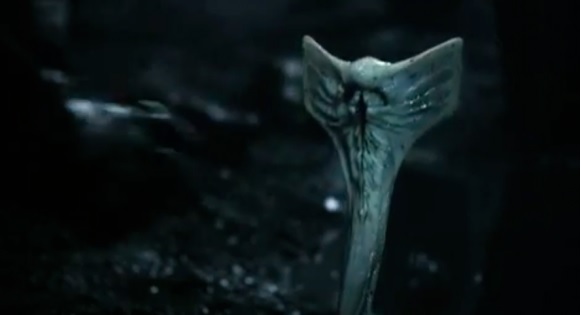 What is concealed in Alien is unfortunately revealed in Prometheus. Revelations are made at the outset, with the “Engineers” seeding human life on Earth from their own DNA. There is no sense of cosmic horror when the scientists arrive on the alien planet as we already know what they’ll find. This is where Metroid Prime marks itself as the true spiritual successor to Alien. In the Chozo Ruins, you explore the remains of an ancient civilization. 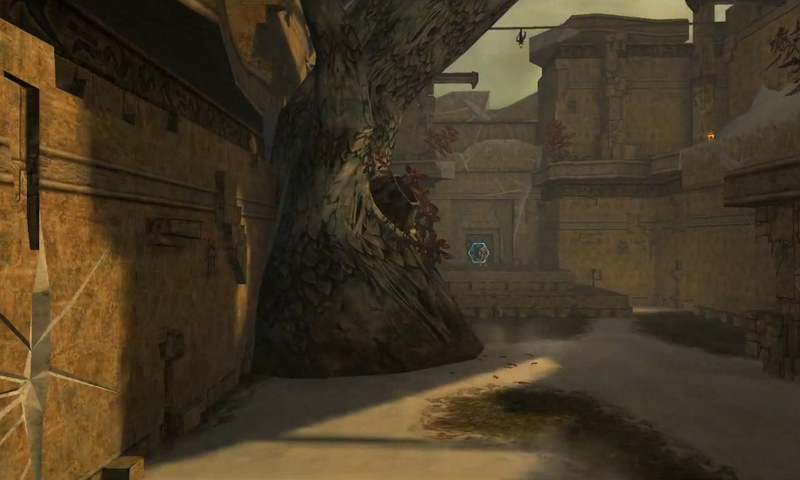 You map out the planet’s regions and buildings, uncovering prophecies about the Chozo’s fate. 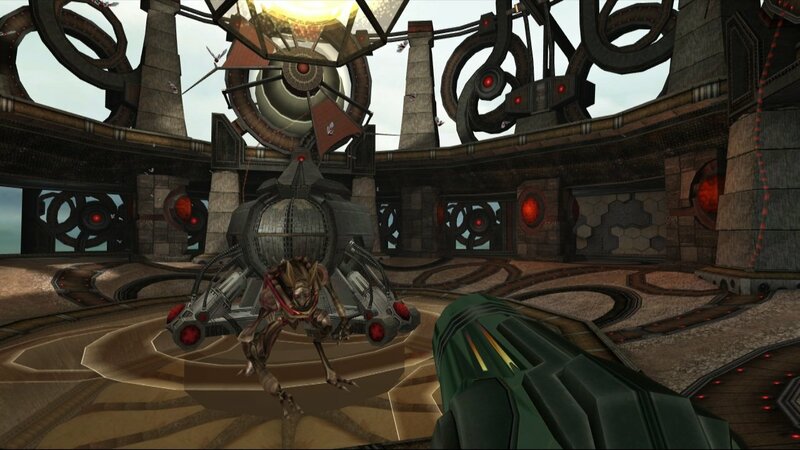 Exploration is at the heart of Metroid Prime, and you are immersed in your eerie alien surroundings. The alien architecture is complex and interesting throughout the Metroid Prime series. Disappointingly for a movie franchise founded on H.R. Giger’s art, Prometheus lacks truly interesting production design. Most of the scenes within the alien ship are shot in almost complete darkness, while the Prometheus itself is bland. This not-quite-a-facehugger is clearly bad news. And yet a Prometheus crewmember tries to touch it anyway, resulting in groans from the audience. The old video game rule applies – if it moves, shoot it. Samus Aran would have made short work of this baddie. 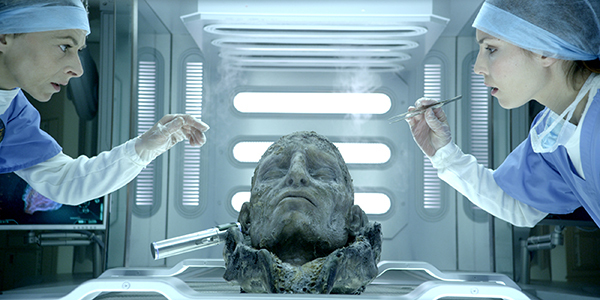 Dodgy science continues as the Prometheus crew bring back a decapitated Engineer head and attempt to… actually I’m not sure what happened in the scene with the head. It appeared as though the crew attempted to resurrect it using an electrical current. I began to understand why the Engineers have a grudge against the humans. In contrast, Samus Aran is an ally and savior to alien peoples. 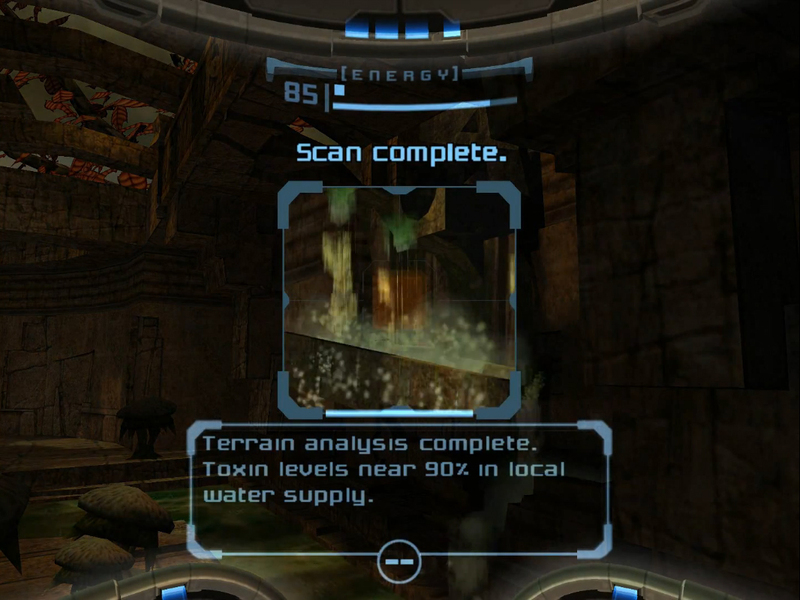 In Metroid Prime, the Chozo have been destroyed by a meteor strike that brought a radioactive element known as Phazon. As you travel throughout Tallon IV you uncover lore – ancient texts that recount the Chozo’s final days. The Chozo’s dying wishes – to see their planet restored – would ultimately be fulfilled by Samus. 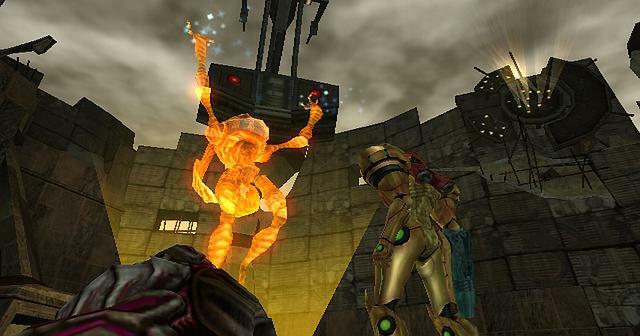 Order from chaos – Samus Aran eliminates the Phazon corruption on behalf of the Luminoth in Metroid Prime 2: Echoes. In Metroid Prime 2: Echoes there is more at stake. Samus meets the Luminoth, aliens suspended in stasis while their planet is destroyed. Like the Chozo, the Luminoth are tragic figures that had lost all hope. As Samus, your actions push back enemy attacks and ultimately restore their planet – and their society. The plots for the Metroid series are not complicated, but they are coherent. Samus’ actions gradually restore peace to corrupted worlds. Prometheus is confused and confusing, with plot-holes disguised as “big questions” to be answered in another movie. For example: the canisters of black ooze. The movie never explains what they are – or how Michael Fassbender’s android David knows how to use them, despite never having encountered them before. And then there’s the concept of aliens creating human life on Earth. So bad is this pseudo-science that even one of the movie’s characters remarks that the central hook trashes years of evolutionary theory. Samus Aran is the classic videogame silent protagonist, but she is still more of a complete character than the tropes trundled out in Prometheus. Your actions as a player (and her back-story) make Samus a sympathetic figure. Orphaned as a child by a Space Pirate attack, Samus is raised by the Chozo race who designed her Power Suit. Samus has no angst. She is a tough-as-nails mercenary who respects the alien civilization that raised her. The Chozo’s faith is repaid by Samus saving Tallon IV and Aether. She is not defined by anything except her own strength and resourcefulness. She is the inheritor to the legacy of Sigourney Weaver’s Ellen Ripley. Hard acts to follow for Noomi Rapace as Elizabeth Shaw, who is the best thing in Prometheus. But she is hampered by a dire script and contrived plot points that maneuver Shaw into an squid-alien pregnancy and an emergency C-section. What happened to the Alien series? The classic sci-fi horror original and ’80s actioner sequel have given way to a derivative franchise and now a messy prequel. Sci-fi movies like this have lost ground to video games. The Metroid series has taken up the genre conventions of Alien – and deepened the experience through its interactivity, sense of immersion, exploration, cosmic horror, and strong female protagonist. Prometheus 2 can wait; let’s have a Metroid Prime 4 please. Thank you! If only Samus had been on the Prometheus – the crew would not have tried to pet any aliens, that’s for sure. Prometheus was a disaster, mainly due to the idiotic script. The dialogue is so bad it renders the film unwatchable; stick it on mute, though, and you have a beautifully shot film, which is where Scott’s main skill lies. However, there are many video games which struggle with the same script problems. The best games, I find, are the ones which ignore the modern fad of including endless cutscenes with dreadful voice acting. Keep the story bare bones, make sure your video game is a video game (Breath of the Wild did this perfectly), and all is good. Metroid Prime 4… quite the marvellous news, too.